LSBU this week dedicated a research and development space for its Nathu Puri Institute for Engineering and Enterprise, so named in recognition of a substantial donation from industrialist and entrepreneur Nat Puri to the university. The formal launch of the R&D space follows the institute's founding in 2011, which aims to foster enterprise amongst engineers, help prepare the next generation of engineering leaders and support the UK engineering industry in enhancing its competitive advantage. Professor Nathu Puri, founder of the multinational Purico Group—and former student of one of LSBU's predecessor institutions—made a significant contribution to the institute that was supplemented by further funding from the government's higher education gift matching scheme. "The creation of this institute has only been possible thanks to the amazingly generous gift from Professor Nat Puri and to the corresponding matched funding from HEFCE," said Professor Rao Bhamidimarri, Executive Dean of LSBU's Faculty of Engineering, Science and the Built Environment. "We are excited to formally open dedicated R&D space at LSBU's Southwark campus to enable the institute to continue its research at the intersection of engineering and enterprise." In his remarks to mark the occasion, Professor Puri emphasised the need to educate students with an ability to take risks. He also reinforced the need for engineers to be introduced to non-technical topics such as business and finance, contract law and organisational psychology. He said that successful people learn to capitalise on any help they can get, as they are developing a business. The institute comprises a professorial chair in engineering and management, a professorial chair in engineering and enterprise, two senior lecturers in engineering and enterprise, research and development space, and other facilities. 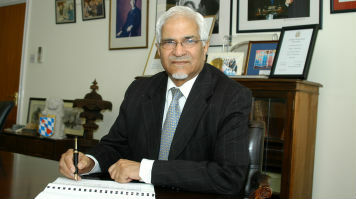 Nathu Puri studied at what was then the National College for Heating, Ventilating, Refrigeration and Fan Engineering when he first came to the UK from India in the 1960s. He has said his time studying "changed his life" and has since become a longstanding supporting of LSBU, who presented him with an honorary doctorate in 2007. At the institute's opening in 2011, Business Secretary Vince Cable MP in attendance said: "The establishment of this institute shows that philanthropic donations can lead to great things for a university, its students and the economy. "This new facility gives students the means to transform their abilities in science and engineering into dynamic businesses for the future."